Richie Powell, piano; George Morrow, bass. Recorded on February 23, 1955. 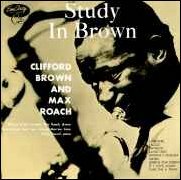 The career of Clifford Brown and Max Roach has followed a steadily climbing course since these two amazing musicians were signed to an exclusive EmArcy contract barely a year ago. The release of a new set of perfomances by them is an event of major importance in jazz circles. The numbers on this particular set have a special distinction: they are the first Brown-Roach combo sides recorded in New York. First on the menu is the 20-year-old Ray Noble standard "Cherokee." Starting out with the melody played in unison by the two horns while Max offers a simple after-beat rhythm accompaniment, the performance gets into high hear with a phenomenal solo by Clifford. The same comments apply, to a large degree, to the solos of Harold Land on tenor saxophone, Richie Powell on piano, and when Max takes over for a demonstration of his unique agility on the snares. "Jacqui" is a lighthearted original composition by pianist Richie Powell, with a theme that has the two horns running parallel, mostly in thirds, with a twelve-bar blues format for the middle part. "Swingin'" [mp3] is a perfomance delightfully suggtestive of its title. The theme is composed of a repeated rising phrase at an expressed tempo, on a chord pattern familiar to jazzmen since the days of "I Never Knew." "Lands End," written by tenor saxophonist Harold Land, is one of the most relaxed and attractive items in the entire set. Based on a unison riff phrase, it is taken at a casual medium gait in a minor key, with a two-beat feel established by bassist George Morrow. After the theme has been established the quintet swings into a Harold Land solo with the more customary four-four beat. The second side opens with "George's Dilemma," a Clifford Brown opus which might aptly have been titled "The Morning After The Night in Tunisia." Afro-Cuban rhythmic backgrounds, and a piano almost suggestive of a Cuban cocktail lounge, contrast strangely with some of the more swinging passages in this effectively varied work, which Max Roach describes as "a romance between Afro-Cuban and jazz rhythms." Clifford Brown's "Sandu" is a humorous, swinging medium-tempo blues. Notice that Clifford's solo, except for one passage in which he flies of into double-time, is very simple, bluesy and earthy. Harold Land, too, though he gets busy at times, keeps close to the blues spirit. After Max has taken over for a while, George Morrow walks his bass solo right into the closing ensemble, a repetition of the original theme. The blues is the basis for the next number, too, though "Gerkin for Perkin" employs a faster tempo and different mood. The title, by the way, is a gesture to Carl Perkins, a pianist on the West Coast. "This is a blues with altered changes," comments Max, "the kind of thing I did a few years ago with Charlie Parker on "Sippin' at Bells." The familiar old popular song "If I Love Again" is ingeniously converted into a jazz theme at a fast tempo through the use of syncopation and rubato. Clifford Brown, in one of his best solos, has some Miles Davis-like moments here. "Take The 'A' Train," written some fourteen years ago by Billy Strayhorn and famous as the perennial theme of the Duke Ellington orchestra, gets an unusual treatment here, thanks to a suggestion by Richie Powell for an introduction and ending idea. Strange though it may seem, this is the first time we have ever heart "Take The 'A' Train" played with train effects! After the theme has been played n unison, Harold Land boards the uptown express at 14th Street; Clifford Brown gets aboard at Times Square; Richie wails at Columbus Circle and Max takes over at 125th Street. By the time the "A" train comes to a halt (at 207th Street, no doubt) everyone is understandably exhausted, but happy to have taken part in a wild and eventful ride.